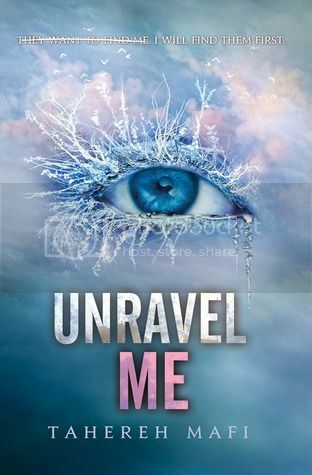 The review for UNRAVEL ME me is going to be different than usual, mainly because as I was trying its threads together throughout the day I kept on coming back to a theme and it was something I wanted to structure my discussion of its story around. There will be mentions of things that happened in both SHATTER ME and DESTROY ME (mainly because I think they're quite relevant to what goes on in this book), so please consider yourself warned. The theme of this review is independence and will be discussed in terms of characters. The Reestablishment & The People: One of my favorite things about the previous installment was the way Tahereh was able to paint such a beautifully destructive picture of what was going on. Birds cannot fly, the Earth was giving up on itself, and humans were doing what they could - had put their faith in the last effort - to put things right. Without having all of the information, the reader was able to put together a puzzle in order to create a vivid image of the world. UNRAVEL ME, however, touches upon the lives of the people in a peripheral way that sets the stage for what may be an uprising. As this is a dystopian story, the government is supposed to be protecting the people (and perhaps they believe they are, in a way) but we begin to see what their lives look like and what little options they have. The luxury of choice is affordable only to those in the Reestablishment; citizens are scant less than pawns to be moved around. And these pawns are sick of it - they want to reach the other end of the board and have the chance to become what they want. The move toward freedom. Warner: Warner is not a nice person. He's just not - he's killed people, he's ordered people to death, he's had people tortured. And so when there were mentions that from this book sprang some form of "Team Warner" I was incredibly concerned. To be fair, I'm not in love with Adam the way Juliette is (mainly because I haven't been missing that same need for connection that she has), but I appreciate his presence in the book. (I also liked him more in SHATTER ME than I did in this book, but that's neither here nor there.) While I wouldn't call Warner a megalomaniac, he definitely has very specific personality traits, and if you've read DESTROY ME you get a glimpse of them: extremely orderly, well-groomed, habitual. Warner, it seems, doesn't care too much for change merely because change has never offered him anything. The one exception to this rule has always been Juliette, which brings me to this: Warner is not a "bad boy", he's not the brooding type that leans in doorways and will smother you with mystery. He's the type that will shoot you if he has to and then not think about it, because that's how he was raised. There is a very clear difference between the two, and I don't think that those facets alone make him interesting or attractive. For me, Warner's arc started in DESTROY ME and reading that is key to understanding why and how Warner also finds his own independence. The thing about Warner, for me, is that he is the one that has supported Juliette's independence the most. Though he had his moments of professing his love throughout the series, he's never made any pretense about it. So while people's favorite chapter may be the infamous sixty-two, mine is the very last chapter of the book because it's the one point where we've seen Juliette in a situation that seems completely normal, a scene that would not be out of place today. Juliette has always wanted to see a bird fly. In UNRAVEL ME she found her wings. Tahereh Mafi has built upon a ravaged world where her characters shine the brightest, and there just might be a possibility for flight. 2 comments on "review: unravel me by tahereh mafi"
I've only read Shatter Me and I'm not sure I'll ever read the rest of this series. I do like hearing that Juliette grows up a bit. She was far too pliable for me.